Keetham lake, also known as the Sur Sarovar, is a scenic lake just outside Agra on the Agra - Delhi highway (NH 2). This scenic lake, is about 20 km from Agra and 12 km from sikandra is located within the Sur Sarovar Bird Sanctuary. Keetham Lake is linked by Railway track at Keetham Railway Station and was declared as National Bird Sanctuary on 27 March 1991 by U.P. Forest Department. The riverine belt of River Yamuna surrounds the area of Sur-Sarovar. The entire lake is formed in a catchment area of 7.13 km². Keetham Lake is pentagonal in shape. There are artificially created islands for shelter and breeding grounds to the migratory birds. The best thing is that is placed on the way of Delhi and tourist can visit during their journey to Agra. The climatic conditions of the lake area is typical of Uttar Pradesh plains with hot windy summers and extremely cold winters. The average temperature ranges between 1.5 C to 49 C. The monsoon season occurs during July to September. U.P. Forest Department has created woodlands and developed shallow areas near lake, making it a natural habitat for birds nesting sites. Controversially, Uttar Pradesh Government has decided to reduce the Eco-sensitive zone limit around Keetham Lake from 10 kilometres to just 250 metres. More than 106 species of migratory and resident birds are known to have their resting habitats at Sur Sarovar. The entire lake area gets covered by profuse growth of macrophytic vegetation of water hyacinth (Eichornia sp.) and Potamogeton sp. during summers. The water quality of Keetham lake supports wide range of avifauna during winter season. The important aquatic birds inhabiting Keetham lake are: Little Grebes, Cormorants, Darter, Grey Heron, Purple Heron, Paddy Bird, Cattle Egrets, Large Egrets, Smaller Egrets, Little Egrets, Night Heron, Indian Reef Heron, Black necked Stork, white Ibis, Eurasian Spoon Bill, Greying Goose, Bar headed Goose, Lesser Whistling Teal, Ruddy Shelduck, Northern Pintail, Common Teal, Spot Billed Duck, Gadwall, Wigeon, Shoveler, and Comb Duck. 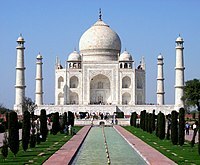 ^ "Environmentalists oppose move to shrink eco-zone near Taj Mahal". Retrieved 12 July 2015.